Found in old gardens across Australia, Aloe arborescens was originally used because it was one of the best ornamental aloe species and also very drought tolerant. 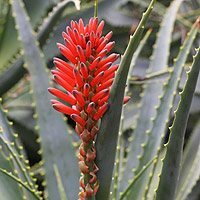 A flowering succulent with attractive orange to red flowers, t is known in its native South Africa as the Krantz Aloe. Very popular for those with ‘healing gardens’ and it has made its way to China where it is used for medicinal purposes. Today with many new hybrids available Aloe arborescens is not as widely used for its ornamental characteristics, it is still available for sale and we believe it makes a good garden plant. This is a relatively easy plant to grow, given good drainage and a sunny position. In its natural environment it grows in fairly poor soils on rocky outcrops. As is grows it will form a clump, hard spiny leaves make it unattractive to animals. Over time Aloe arborescens can reach 3m in height. Said to have a number of medicinal benefits, most are undocumented, however studies into the wound healing properties do seem to be positive. A small stem is removed from a larger clump. Allowed to heal for 3 – 4 days until the cut callouses over a little. Plant in a well drained soil, or a sand based propagating mix. Cuttings do not require constant watering. Allow the sand or soil to dry well between waterings to prevent rot. Seed can be sown in spring in a propagating mix, preferably in a cold frame.